San Francisco sunshine and fine viennoiseries! What could be better? Ok, maybe a trip to the French Riviera! However if you can't get away to France but need an escape from the humdrum of day-to-day life (and American pastries), then visit Le Marais Bakery. Le Marais Bakery succeeds at offering truly authentic French pâtisserie. I love that the pastries are not "dumbed down" for the local audience who may not know how each dessert should taste. Mais non! 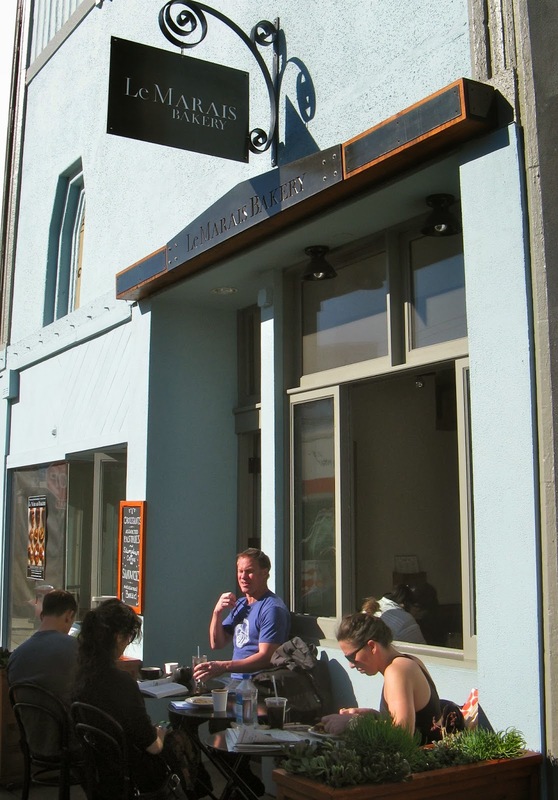 Le Marais Bakery does not underestimate the California customer. Instead the bakery caters to those with finer tastes. The pastries that you'll find at Le Marais Bakery are not Americanized or adulterated in any other way. They're not too sweet. They're not too big. They are just right! They're made with freshest highest-quality ingredients. In addition, all of pastries at Le Marais are traditional, artisanal and organic. Merci beaucoup! Le Marais Bakery offers a wide selection of classic French pastries. 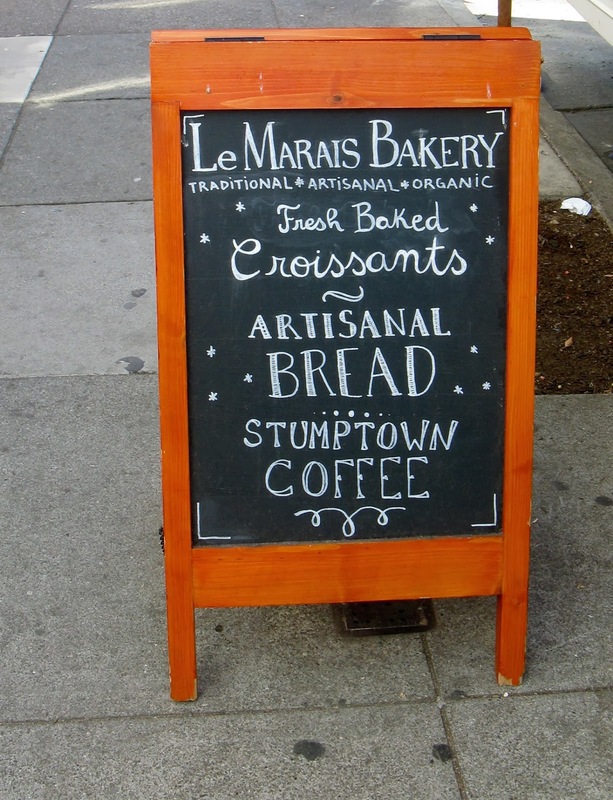 Le Marais offers fresh coffee and handcrafted breads in addition to French pastries, croissants, quiches and sandwiches. My favorite dessert from Le Marais was the Lemon Tart. Perfectly balanced between sweetness and citrus flavors, this creation reminded me of the lemon tart from Gérard Mulot Pâtisserie in Paris—the highest praise that a lemon tart could ever earn! One of the finest pâtisserie establishments in Paris, Gérard Mulot is well known for its Tarte au Citron (lemon tart). 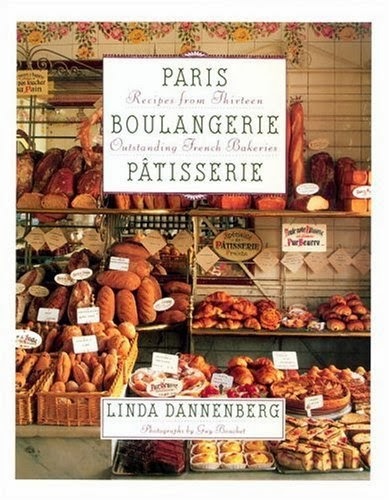 Cookbook author Linda Dannenberg shares Gérard Mulot's Tarte au Citron recipe (see below) in her Paris Boulangerie Pâtisserie publication. Le Marais Bakery's Lemon Tart is delicious and beautiful (it's decorated with fresh marshmallows). The Apple Tart was wonderful, too! Le Marais offers one of the classic French preparations of tarte aux pommes (apple tart): traditional butter crust baked with frangipane (almond cream) and slices of fresh apple. The Apple Tart is made with "fragipane" and delicious butter pastry crust. I also appreciated Le Marais' financier (almond cake), which was perfectly moist and rich. I believe it may have been made with ground hazelnuts in addition to almond powder. Impressively, the presentation is so fancy that it outdoes any French version. Typically a financier is just a simple cake without any decoration. Originally this dessert was just a quick snack that French bankers (financiers) would pick up on the go, hence the name! This is the fanciest financier that I have ever seen ... including the best in France! Le Marais also offers delicious savory items. I enjoyed the vegetarian quiche—featuring broccoli on the day I was there. I'm sure that this quiche was also made with considerable amount of heavy cream and Gruyère cheese, since it's so rich! As you can see by the photo below, the sun shines directly inside Marais Bakery—another reason for it being a staycation destination! The storefront faces south, so in the afternoon you actually need to wear sunglasses inside the shop. The glare would stop anyone from using a laptop, and therefore the bakery is blissfully free of computers. It's a true vacation! Preheat the oven to 400 degrees Fahrenheit. Combine the butter, confectioners' sugar, egg, salt and vanilla, and mix until blended. Sift the flour, then gradually add it to the butter mixture along with the almonds. Don't mix it too much or the pastry will get tough. When the dough starts to come together, cut it in half, shape into two disks and refrigerate for at least one hour. Once the dough is chilled, place one of the disks on a lightly floured surface or on wax paper. Roll it out to the dimensions of 11 inch diameter and 1/8 inch thick. Line a 9 inch tart pan with a 9 inch circle of parchment paper or coat the bottom of the pan with butter and flour. Carefully place the dough on the tart pan, trim off the extra dough at the edges with your rolling pin and then pinch the edges to create a decorative border. Cover the dough with parchment paper and fill with beans or rice (this is a "blind baking" technique to make sure that the pastry doesn't puff up while baking). Bake for about 10 minutes, until the pastry is a pale golden color. Remove the filling and parchment paper. Now your pastry shell is ready for the pastry cream (next step). *In a saucepan, heat the lemon juice, butter and 3/4 cup of the sugar over low heat until the butter has melted and the mixture comes to a gentle simmer, about 2 minutes. *Meanwhile, with an electric mixer, beat the eggs, egg yolks, and remaining 1/4 cup sugar at medium-high speed until the mixture is pale and light, about 4 minutes. *Lower the mixer speed and slowly pour the hot lemon juice mixture into the egg mixture, beating until blended and fluffy, about 3 minutes. *Return the mixture to the saucepan and cook over medium-low heat, stirring constantly with a wooden spoon until the mixture nearly starts to simmer, about 3 minutes. *Transfer the lemon cream to a metal mixing bowl and refrigerate until cool. If not using immediately, lay a sheet of plastic wrap or wax paper directly on the surface of the cream. *With a rubber spatula, spread the cooled lemon cream evenly into the pastry shell; it should nearly fill the shell. Smooth the top with the spatula. *Return the tart to the oven and bake for 5 minutes longer, which will set the filling slightly without coloring it. *Remove the tart from the oven and carefully remove the tart from the pan, then allow the tart to cool on a wire rack. *Refrigerate the tart until the filling is firm. *Take the tart out of the refrigerator 10 to 15 minutes before serving. The tart is best enjoyed on the day it is baked. Serves 6 to 8 people. Mmmm!! Bakations are finger-licking good!! Such a perfect size pastry! I think the perfect meal would be the vegetarian quiche with broccoli followed by the perfect size and irresistible financier. I miss France but can't go back soon, at least I can come here in the meantime!